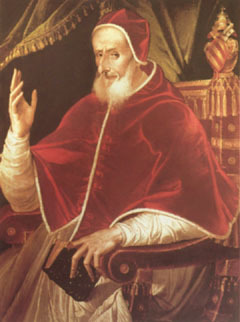 Pius V, given name Michele Ghislieri, Roman Catholic Pope from 1566 to 1572, was born on the 17th of January 1504, in the Milanese. At the age of fourteen he became a Dominican monk. His austere life, his vehemence in attacking heresy and his rigorous discipline as prior of several monasteries proved his fitness for the work of reform, and he was appointed inquisitor in Como, where his zeal provoked such opposition as to compel his recall (1550). The chief inquisitor, Caraffa, convinced of his value, straightway sent him upon a mission to Lombardy, and in 1551 appointed him commissary-general of the Holy Office. When Caraffa became pope, Ghislieri was made bishop of Nepi and Sutri, cardinal (1557), and finally grand inquisitor, which office he discharged in a manner to make the name of "Fra Michele dell'Inquisizione" a terror. In this office he was continued by Pope Pius IV, whom, however, he repelled by his excessive severity, and antagonized by his censoriousness and obstinacy. But the movement with which he was so fully identified was irresistible; and, after the death of Pius IV, the rigorists, led by Borromeo, had no difficulty in making him pope on January 7, 1566. Though pope, Pius did not cease to be a monk: his ascetic mode of life and his devotions suffered no interruption. Without delay he applied himself to the work of reform. Decrees and ordinances were issued with astonishing rapidity: the papal court was rid of everything unseemly, and became a model of sobriety; prostitutes were driven from the city, or confined to a certain quarter; severe penalties were attached to Sunday desecration, profanity and animal baiting; clerical residence was enforced; conventuals were compelled to live in strict seclusion according to their vows; catechetical instruction was enjoined. A new catechism appeared in 1566, followed by an improved breviary (1568), and an improved missal (1570). The use of indulgences and dispensations was restricted, and the penitential system reformed. Pius was the avowed enemy of nepotism. One nephew, it is true, he made cardinal, but allowed him no influence: the rest of his relatives he kept at a distance. By the constitution Admonet nos (March 29, 1567), he forbade the reinvestiture of fiefs that should revert to the Holy See, and bound the cardinals by oath to observe it. In March 1569 Pius ordered the expulsion of the Jews from the states of the Church. For commercial reasons they were allowed to remain in Rome and Ancona, but only upon humiliating conditions. In February 1571, the Umiliati, a degenerate monastic order of Milan, was suppressed on account of its complicity in an attempt upon the life of the archbishop, Carlo Borromeo. The election of Pius to the papacy was the enthronement of the Inquisition: the utter extinction of heresy was his darling ambition, and the possession of power only intensified his passion. The rules governing the Holy Office were sharpened; old charges, long suspended, were revived; rank offered no protection, but rather exposed its possessor to fiercer attack; none were pursued more relentlessly than the cultured, among whom many of the Protestant doctrines had found acceptance; princes and states withdrew their protection, and courted the favor of the Holy See by surrendering distinguished offenders. Cosmo de Medici handed over Pietro Carnesecchi (and two years later received in reward the title of Grand Duke, September 1569); Venice delivered Guido Zanetti; Philip II, Bartolomé de Carranza, the Archbishop of Toledo. In March 1571 the Congregation of the Index was established and greater thoroughness introduced into the pursuit of heretical literature. The result was the flight of hundreds of printers to Switzerland and Germany. Thus heresy was hunted out of Italy: the only regret of Pius was that he had sometimes been too lenient. In 1567 Pius condemned the doctrines of Michael Baius, a professor of Louvain, who taught justification by faith, asserted the sufficiency of the Scriptures, and disparaged outward forms. Baius submitted; but his doctrines were afterwards taken up by the Jansenists. The political activities of Pius were controlled by one principle, war upon the heretic and infidel. He spurred Philip II on in the Netherlands, and approved the bloody work of Alva. He denounced all temporizing with the Huguenots, and commanded their utter extermination (ad internecionem usque). While it cannot be proven that he was privy to the massacre of St. Bartholomew, still his violent counsels could not fail to stir up the most savage passions. He exclaimed loudly against the emperor's toleration of Protestantism, and all but wished his defeat at the hands of the Turks. He urged a general coalition of the Catholic states against the Protestants; and yet published, in sharper form, the bull In coena domini (1568), which was regarded by these very states as an attack upon their sovereignty. One of his cherished schemes was the invasion of England and the dethronement of Queen Elizabeth I, whom he excommunicated and declared a usurper (February 25, 1570); but he was obliged to content himself with abetting plots and fomenting rebellions. He did, however, effect an alliance with Spain and Venice against the Turks, and contributed to the victory of Lepanto (Oct. 6, 1571). Thus lived and wrought Pius, presenting "a strange union of singleness of purpose, magnanimity, austerity and profound religious feeling with sour bigotry, relentless hatred and bloody persecution" (Ranke). He died on the 1st of May 1572; and was canonized by Pope Clement XI in 1712.